I decided to try my hand at designing and 3D printing a phone holder using Solidworks. 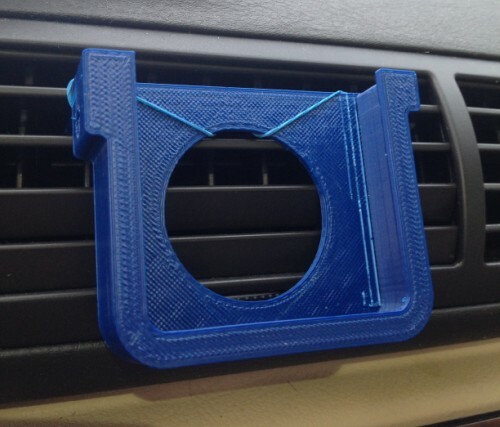 Two prongs on the back allow me to attach it to a car’s AC vent, and the thread on one side allows it to be mounted on a tripod. Designing it myself allows the phone and case to fit snugly. I printed it out in ABS plastic at the Techshop in about 3 hours. The phone fits pretty well, but it’s a little loose. In the next iteration I can tighten up the tolerances. This entry was posted in 3D Printing and tagged 3d modelling, 3d printing, iphone holder, iphone mount, make, solidworks. Bookmark the permalink. What a coincidence, I was looking at your site for something else and saw this. I was thinking about doing something similar last year and just never got around to it. If you’re worried about the fit, I’d recommend making the space a little wider and putting in some foam. The local hobby store or Walmart will probably sell .1″ thick pieces of foam 8.5″x 11″ that I really like. Good Luck!